As we mentioned in our first welding article, MIG welding is a process which a power wire electrode is fed continuously into the welding puddle at a controlled constant rate. The wire is connected to the positive side of a rectified voltage supply (DC current). The workpiece is connected to the negative side of the supply. When the wire is fed, it comes into contact with the workpiece and an arc is struck. The arc melts the wire and it is deposited onto the workpiece. The wire, which is fed by the wire feed motor into the weld pool, burning itself off at a rate dependent upon the selected wire feed speed. The faster the motor speed, the higher the current drawn by the arc. Thus wire feed controls welding current. To protect the weld puddle from oxidation and impurities during the welding process, a shielding gas flows over and around the weld puddle. Note that poor gas coverage will result in poor welding, excessive gas coverage can cause gas to flow in eddies and reduce the shield effect. Using too much gas is also expensive and wasteful. MIG welders come in many sizes and shapes and, while the overall process is the same, welders differ widely. The best approach is to start with your welder's instruction manual. It should give you information on set-up for a variety of situations. In the event that your manual doesn't provide adequate information, or you don't have the manual, here are some tips on setting up your welder. The inside of our welder is fairly simple: the wire spool and wire feed mechanism. 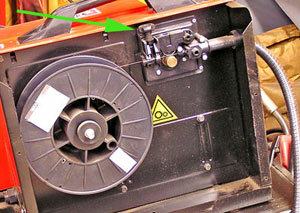 The green arrow shows the wire tensioner knob. The wire used for most automotive applications usually ranges from .023 inch through .030 inch. The lighter .023 inch wire is often used for welding thin materials because it can be used at lower currents (10 to 20 amps) and voltages (120), greatly reducing heat input to the base material. The wire unrolls from the reel through a guide and over a motorized roller, which feeds wire through another guide and into the cable going to your torch. Lay your torch and cable out on the floor as straight as possible. Mount the wire spool into the machine. Be careful when cutting the end of the wire which is usually bent over to lock it into a hole in the side of the reel. There's winding tension on the wire and if the cut end of the wire gets away from you, it can start unraveling all over the place. Don't cut the end loose until you are ready to feed it. Make sure that the wire feed mechanism has a good hold on the wire before letting go. Hold the end of the wire with pliers or vise-grips and carefully sand the cut end until smooth. A sharply-cut end may snag as it travels through the cable. While firmly holding onto the wire, feed it into the guides, over the rollers and into the torch cable. Once you have about 6 inches of wire fed into the cable, plug in and turn on the welder, set the wire-feed speed about a quarter of the way, and pull the trigger. Adjust the wire tensioner until the rollers are feeding the wire then turn it an additional ¼ turn. With the nozzle and contact tube unscrewed from the end of the torch, run the machine until the wire comes out the end. Check the wire-feed mechanism to make sure that the adjustment not only feeds the wire consistently, but also allows the wire to slip. To test for slippage, hold the contact tube against some immovable object and pull the trigger. The wire should slip on the roller. Sometime in your welding experiences it's likely that you could weld the wire to the contact tube. If you then continue to pull the trigger and it can't slip, you could end up with a cable full of tangled wire. For most of our restoration applications, we will use a mixture of 75% argon and 25% CO2. This mixture is more expensive than plain CO2 but produces much less spatter and consistently better looking welds. This mixture can also be used for welding stainless steel, but a mixture of 90% helium, 7.5% argon and 2.5% CO2 will give you better results because it tolerates a higher heat needed for the normally sluggish weld puddle on stainless. A basic regulator was supplied with our welder. A better solution would be one that not only showed flow rate of gas, but also indicated how much gas was left. Even better yet is a floating-ball flow meter which is easier to read from a distance. Handle the shielding gas cylinder with care. Always treat cylinders as if they are full and always positively identify the content of the cylinder. Use only cylinders with names of the gas marked on them. Do not rely on the color of the cylinder to identify gas content. Notify your gas supplier if the cylinder is unmarked. It is illegal and hazardous to deface or alter the name, number or other markings on a gas cylinder. Keep in mind that gas cylinders may be pressurized to more than 2,000 pounds per square inch and the results of being treated carelessly could be deadly. Secure the cylinder in place on your welding cart (or wherever you have it installed) with a chain or strap to keep it from falling over. Take care not to cross thread or strip fit when installing a regulator on a cylinder. 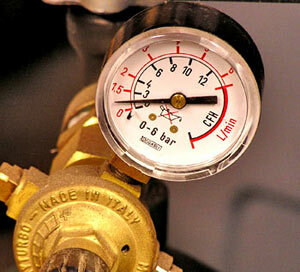 Open the gas regulator using recommendations in the user's manual. If none are available, start at approximately 1-3/8 to 1-1/2 cubic inches per minute or 15 to 25 cubic feet per hour. Put on all the protective safety equipment described in our first article, and turn on your welder. Using your wire cutters, trim the wire so that it sticks out beyond the nozzle by no more than 3/8" to 1/2". Set the voltage setting to the desired number. Lower settings for light sheet metal, higher settings for thicker metal. Start with a piece of scrap metal that is free of paint and rust. Attach the ground clamp to the scrap. Turn the wire feed to a high setting. 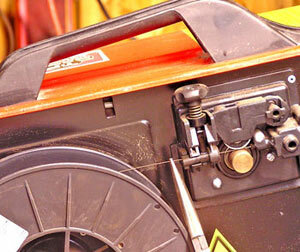 With your welding helmet in place, pull the trigger, initiate an arc and start to turn the wire speed down slowly. Listen as you continue to decrease the wire feed speed. The sound will go from a sputter to a high pitched buzz. This buzz indicates that you are at the proper wire speed setting for the thickness of metal you are welding. You must re-tune the wire speed whenever the heat setting is changed. Always start with a higher wire feed speed setting and work down. This will reduce the number of contact tips that are burned up during the welder tuning procedure.